James Lynn, Goldsmith: What+Is+Mokume+Gane? : "Spiritual and scientific, aesthetic and technical. Mokume hints at the mystery and wonder of our complex reality..."
Mokume gane translates as "Wood Grain Metal," and refers to a family of techniques of layering and patterning differing metals or alloys. It originated in Japan in the 17th or 18th century, with the master craftsman Denbei Shoami. It was unknown in the West until the 19th century, and little understood here until the 1970s, when Hiroko and Eugene Pijanowski began investigating it. They inspired a small but vigorous movement, which continues to evolve in the metal arts community. In the 80s, George Sawyer published an article on his technique, which got me started. 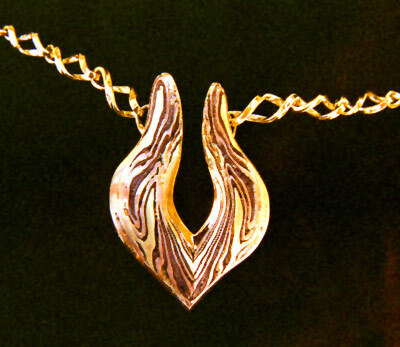 Still practiced in Japan using traditional methods, mokume has proliferated into a number of variations on the original techniques. The basic idea is to laminate many layers of different alloys together, then compress the stack so that it becomes a sheet with a lot of thin layers in it. There are many ways to manipulate the sheet to bring out a pattern. Although traditionally the layers are bonded without solder, the method I use to make mokume gane jewelry requires first soldering the layers together into a stack. I forge and roll this thick stack into a long strip, and begin folding it. When it's all folded together, it looks like a messy wad of metal about the size of a walnut. I forge the "wad" down into a neat billet, distorting the folds to create the pattern. I remove slices of the billet to make rings and other pieces. All the slices from a particular billet have a nearly identical pattern. 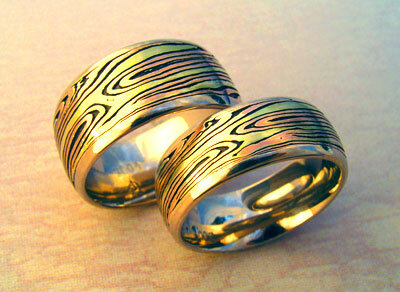 This allows me to make pairs of rings that are just alike, or that are mirror images of each other, even if they are of very different sizes, and to use mokume in "bookmatch" or "butterfly" patterns in other pieces.